A collection of personal essays and columns by Philadelphia-based writer Alyce Wilson. From ponderings about Marilyn Monroe’s dress size to giant cow statues to dog aesthetics, she explores the humor, beauty and depth of her life experiences. “With a well-turned phrase, a stunning clarity, and the occasional quirky twist of stream-of-consciousness, Alyce Wilson opens our eyes to the joy and wonder of a world often taken for granted.” – Danielle Ackley-McPhail, author & editor. Here are some excerpts of the book relating to self-help and music; here’s a humorous excerpt related to pet care; and here’s one of the most popular pieces in the book, about pop culture and weight issues. A literary catharsis, progressing from poems of heartbreak and loss to poems of healing and transcendence. Poet Alyce Wilson interweaves family history, world events, and personal experiences in a spiritual journey for healing. Stay Out of the Bin! Learn simple steps you can follow to get published in literary magazines. Includes a guide to copyrights and a listing of market directories, which will help you find places to submit your work. This booklet provides an editor’s inside perspective to help you avoid common mistakes and stay out of the recycling bin. A wildly colorful look at one fan’s silly, anarchic experiences with the Penn State Monty Python Society, packed with photos, funny stories and original sketches. 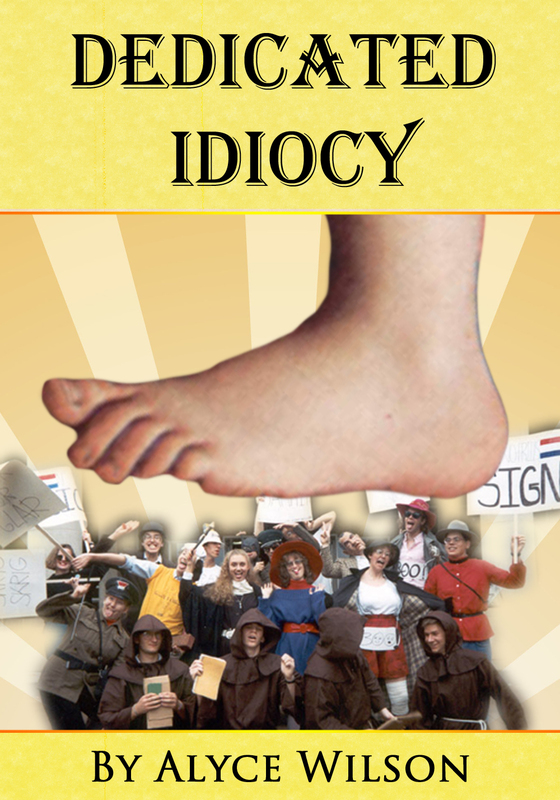 From staging wacky events on the college campus to author Alyce Wilson’s personal interactions with some members of Monty Python, “Dedicated Idiocy” tells a universal story of friendship, played out on the always unpredictable stage of a college campus. In this book for young readers, Felix learns about the DreamWorld from his mother: a place where you can do anything and go anywhere. With a child’s eye for the absurd, he explores this land with his best friends, a robot named Hobart and a dinosaur named Drusus. Felix and his friends fight a dragon, meet a unicorn, and learn that the DreamWorld offers surprises Felix could never have imagined while awake. What would you get if you took a journal writing competition added the twists and turns of reality television and put it on a rollercoaster with iffy brakes? Thus says the community profile of a writing contest like no other. In this book, you’ll find the cream of the first five seasons of the unique competition, plus brand new entries written exclusively for this volume, covering every range of human emotion and experience. Features four pieces (two previously unpublished) by Alyce, who placed fifth in Season 5 of The Real LJ Idol. Buying the book through me is the best way to support me, since I am not earning any royalties. As a bonus, I will sign all copies ordered through me.